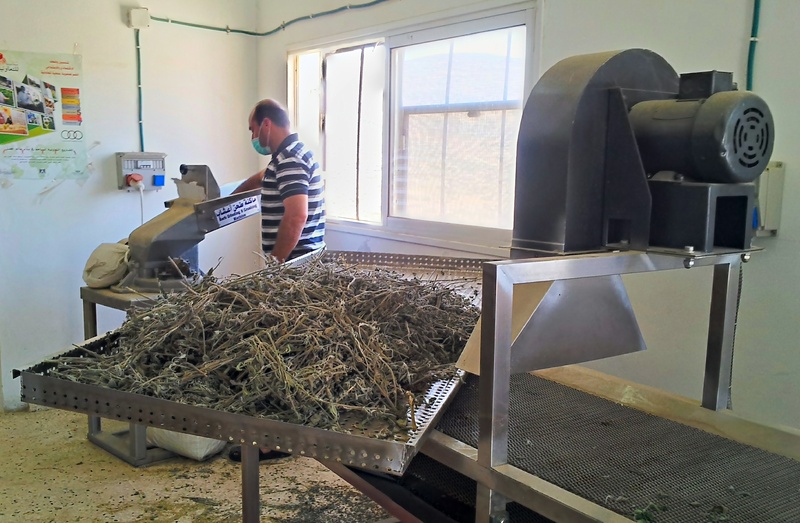 Al-Aqaba, a village with the smallest local council in the West Bank, continually rises above its size and situation by demonstrating community strength through non-violent resistance and proactive development. Since 1967 the village has suffered greatly under the Israeli occupation and faces constant military encroachment and the threat of building demolition. As a result, the original population of 1000 has decreased to the current size of 300 as people left fearing for their safety and livelihoods. The remaining villagers though, led by mayor Haj Sami Sadeq, remain steadfast in their desire to stay and make the village a viable place for people to return to and live. Together they have created a development strategy resulting in new homes and businesses with the help of international involvement and funding. 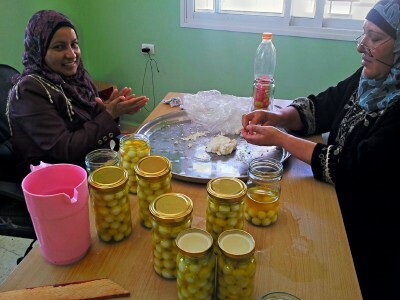 Local women work in the newly opened cheese factory in al-Aqaba. Located in the northeast of the West Bank, on the edge of the Jordan Valley, the village and surrounding land is classified as Area C and, therefore, under complete Israeli military control and civil jurisdiction. The Israeli army have been a constant presence in the area since 1967, when the village was declared a closed military zone and has been subsequently used as a firing zone. A mock village of empty buildings within a kilometre of the village was constructed and is utilised for this express purpose. The military exercises conducted in and around the village at times include the use of live ammunition and, as a consequence, 8 villagers have been killed and 38 wounded. 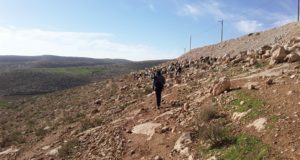 The villagers not only live with the continual disregard of their right to safety and security by the Israeli occupation but have the right to build on their own land repeatedly denied. Labelled a security threat, 97% of the village’s buildings have demolition orders against them, including the kindergarten, the only one in the area, that provides education for 150 children. In the past two years, the Israeli army has demolished several homes, farming shelters and two major roads. 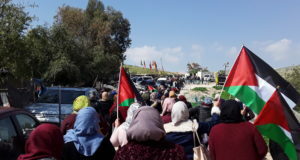 The village is unable to obtain building permits for its own land and has had three master plans rejected by the Israeli Civil Administration, most recently in 2011. The village nonetheless refuses to bow to the ongoing pressure of the Israeli occupation and continues to build infrastructure and houses for its future. Local man at work in the new tea factory in al-Aqaba. Mayor Haj Sami Sadeq responds to this ongoing struggle by asking, “Is the security of Israel compromised if we want to build a building? Does this kindergarten threaten the Israeli security?” The kindergarten in question was built in conjunction with the Rebuilding Alliance, one of 17 different international organisations and embassies that the village has worked with to help rebuild the community over the past ten years. The Rebuilding Alliance, together with the local Housing Association, have also helped to build three, of a proposed twenty, houses to provide residence for some of the 700 displaced villagers who want to return. 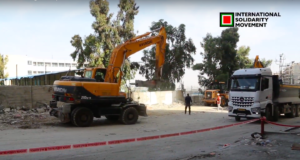 Unfortunately the three houses remain unfinished as the $13,000USD required to finish them promised by the Palestinian Authority (PA) has not been forthcoming because of the PA’s current financial situation. The Housing Association is one of five local groups in al-Aqaba helping to create a stable future for the small community; the other groups at work are the Agricultural Co-op, the Rural Women’s Society, Club for Hope and the Village Council. The Rural Women’s Society helps to operate and run a sewing collective, a tea factory and a newly opened cheese factory. The new businesses create employment for local men and women and are part of a plan that includes the future creation of a herb nursery, restaurant/cafe and conference space that will make the village an even more attractive place to visit. The distinctive double minaret of al-Aqaba mosque. In 2010 a building in the village was renovated to create a guesthouse to provide accommodation for international visitors, including volunteers who have worked at the kindergarten teaching English. This has helped to counter the negative portrayal of al-Aqaba by the Israeli government and army, who have warned internationals that the village is dangerous and their medical insurance will be void upon entering. One current residence of the guesthouse Maurice Jacobsen, is currently filming the everyday life and situation for a future documentary on the village titled ‘Constructive Resistance’. In spite of the daily violations of their basic human rights to dignity, security, housing and property the village persists by building hope and life. In this way the small village has become a model for others in community development and how to attract attention from the international community. The ultimate goal has always been to prevent the village from being demolished and for the villagers to live and build on their land in peace. With current demolition orders for it, one only has to look at the village mosque which has a double minaret in the shape of a peace sign. 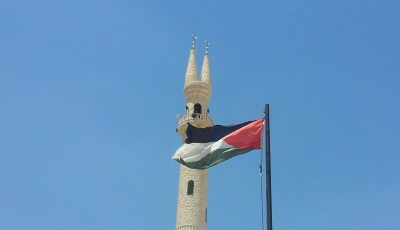 The only one of its kind, it is a permanent symbol of the village’s non-violent resistance when living under occupation. Constructive Resistance Preview 1.1 from The Palestine Chronicles on Vimeo.